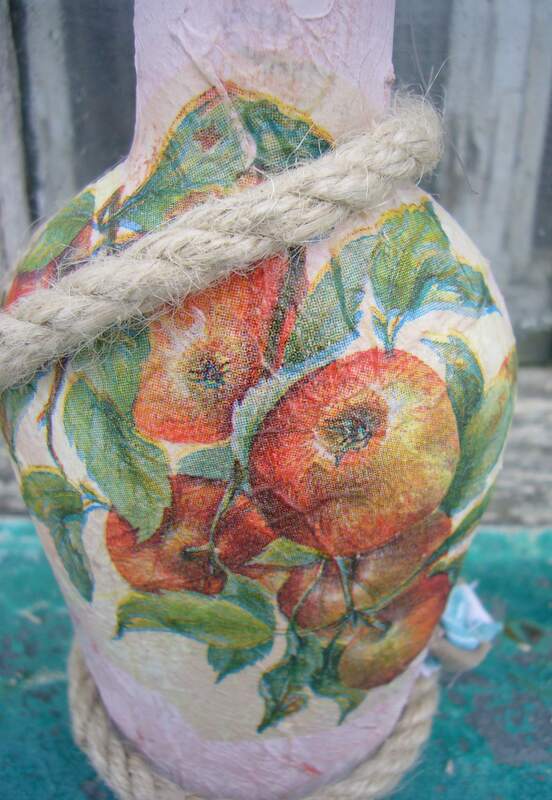 This is one of my latest decoupage projects I really love. It’s decoupage on glass with a napkin. 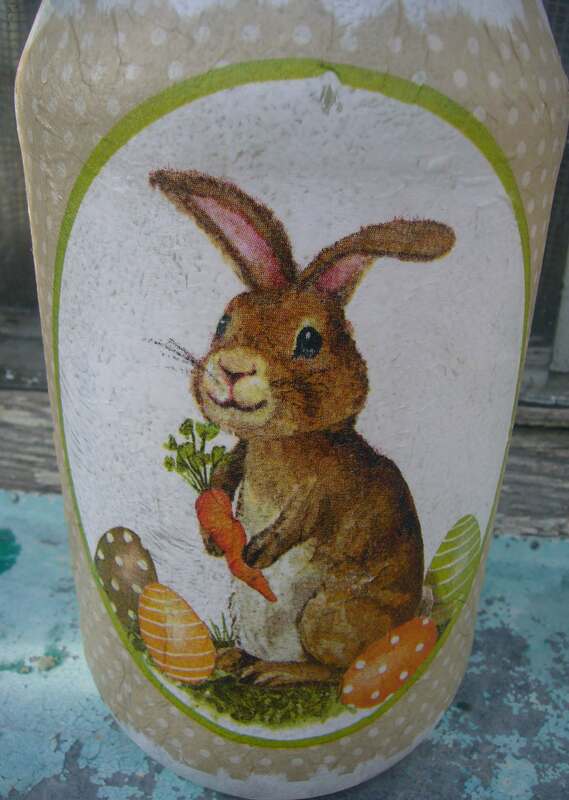 It’s a bunny jar. This is a larger size glass jar. It used to lay around in the barn. 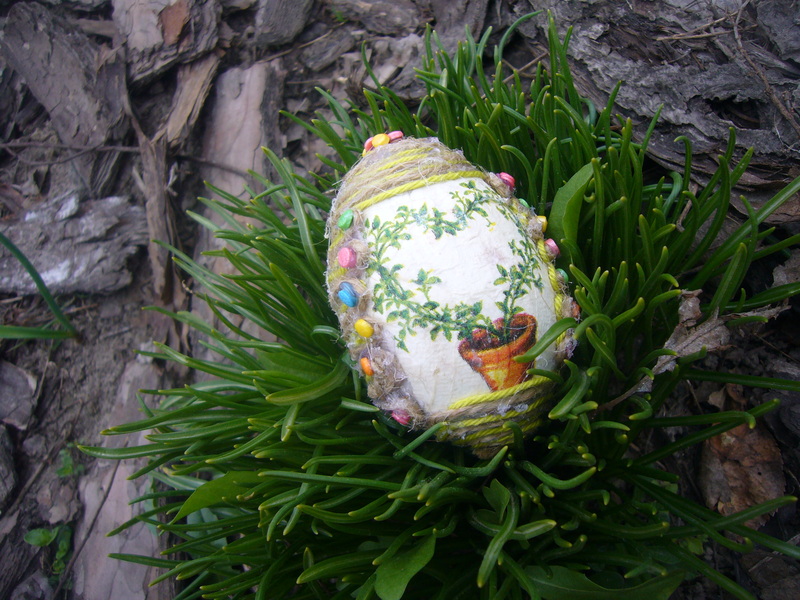 I cleaned it and decoupaged with bunny napkin. – Repaint the glass jar first with acrylic paint. It’s really hard to decoupage on glass, if you do not paint it first. The napkins soak up fast and get easily torn. 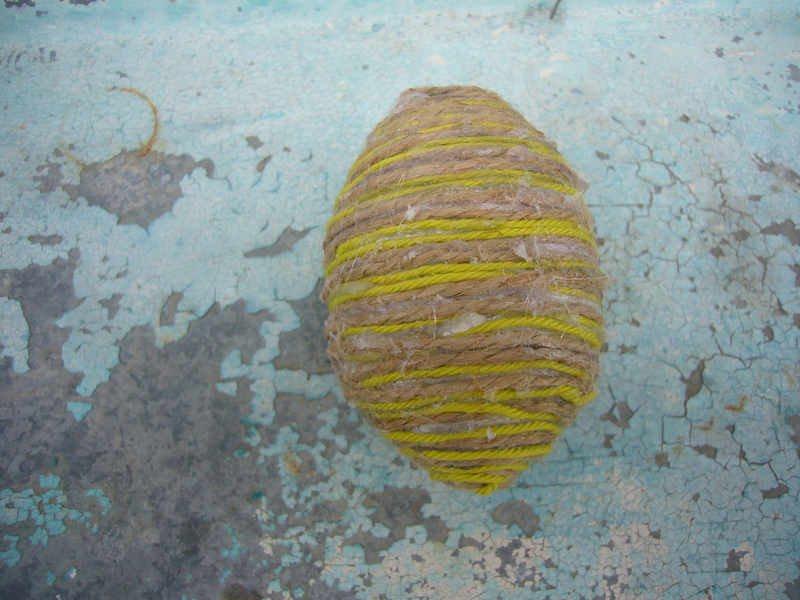 – Once the paint dries up, you can start decoupaging. I use transparent furniture polish instead of glue. First I sparingly apply the polish onto the painted glass. Then I put the napkin on and add more polish to get it stick to the jar. As you may see here, I have made a little dint in the napkin right above the rabbit. Later on I dubbed it with little bit of white paint. – Finally, you cover up the entire jar with more polish. 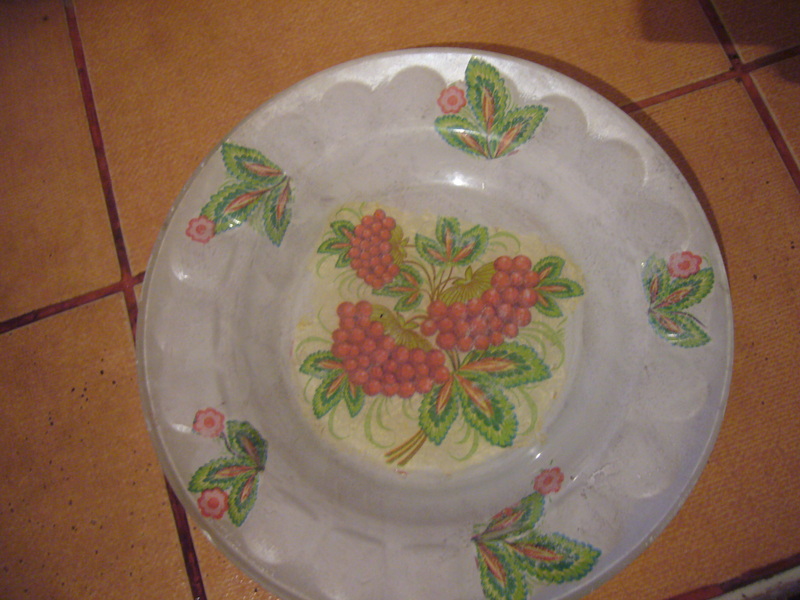 It makes it hard to damage the decoupage and you can wash it. 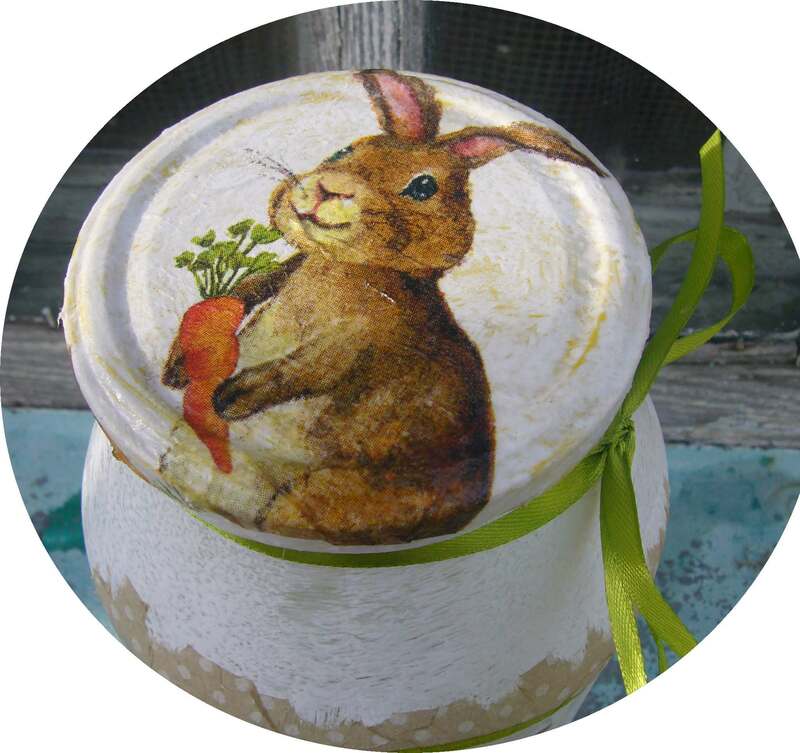 I have also decoupaged the metal lid of the jar. I have also repainted it before decoupaging. Then I added a ribbon as a final touch. 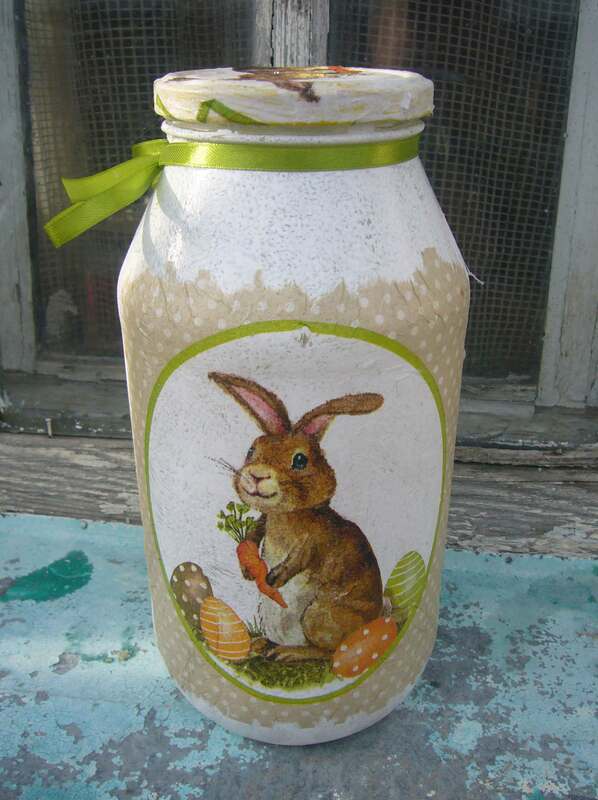 Now I store sugar in this decoupaged glass jar. Follow me on Pinterest and check out my Etsy store. There are many things you can craft for your kitchen to make it cosy and stylish. I love shabby chic or cottage chic styles. So, I try to craft things for my kitchen in soft colors. 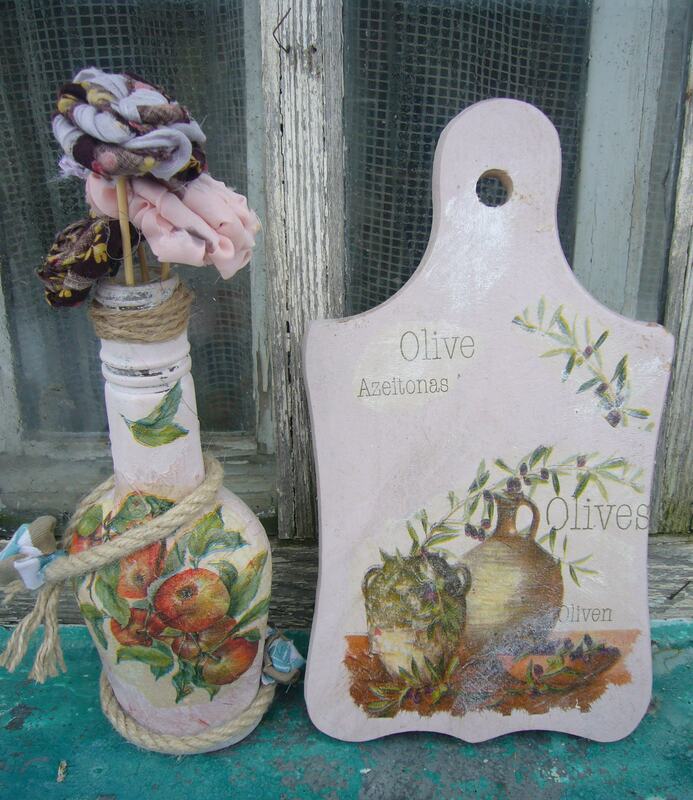 Here are two of my decoupage projects: decoupaged glass bottle vase and decoupaged wooden cutting board. I used the same color vanila paint for both items. Both of these are usable crafts. The cutting board has the other side, where I can cut thing on. Only one side of it is decoupaged. And it is washable, too. I had to put several layers of polish on the wooden board and now I can wash and even lightly scrub it. I have made another cutting board over a year ago and it is still in use and the decoupaged surface was not damaged by water. I do use a lot. I painted one side of the cutting board with acrylic paint. Let it dry. Then I applied the napkin patterns using transparent acrylic furniture polish. Once it has dried up, I shaded the board a bit with acrylic silver paint and put several layers of polish. I really love to upcycle or recycle glass bottles. Most people throw them away, so I ask them to donate the bottles to me and give them a new life. 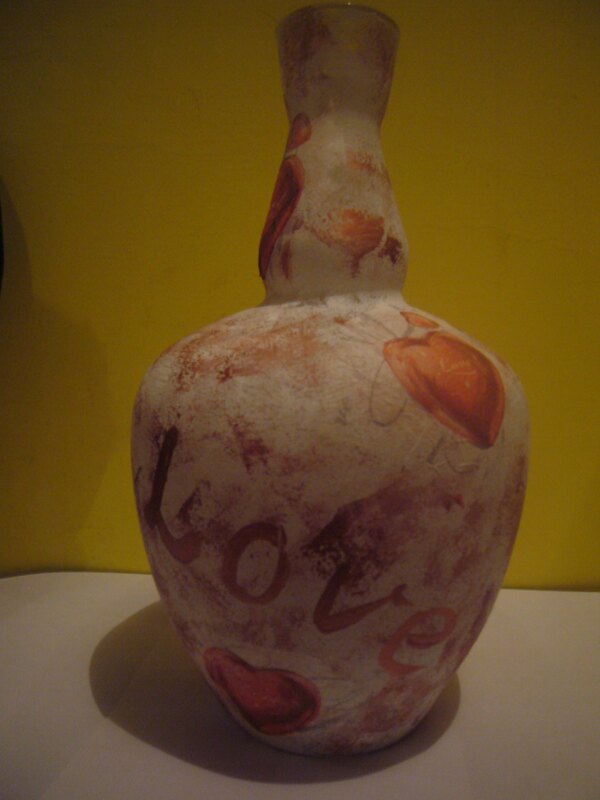 In this particular glass bottle vase I have put two layers of decoupage to create texture on the bottle. Here is my quick tutorial. First, I painted the bottle. 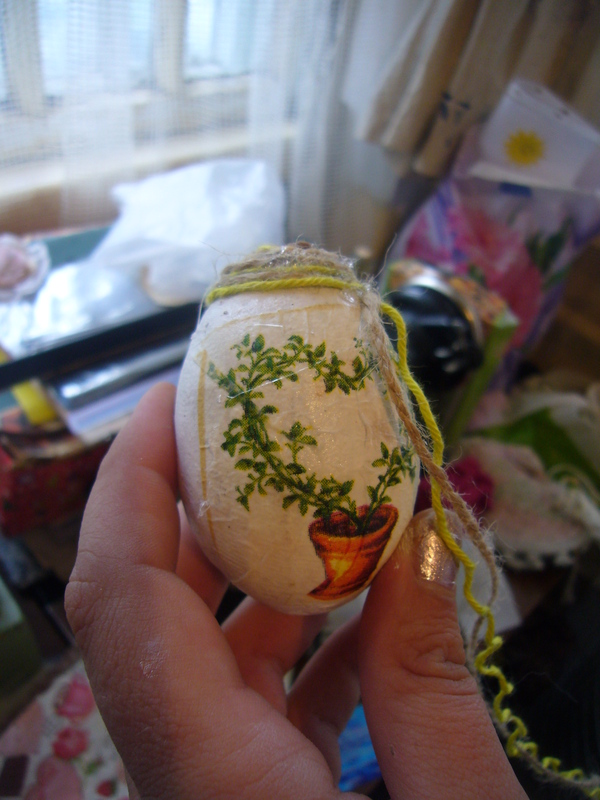 Then I used pieces of old napkins to decoupage it with. 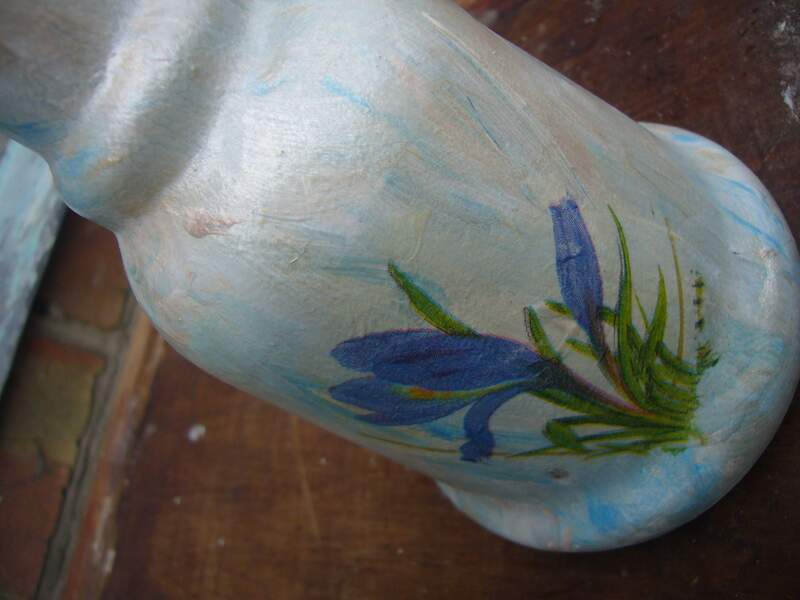 Once they dried up, I have repainted the bottle once more. 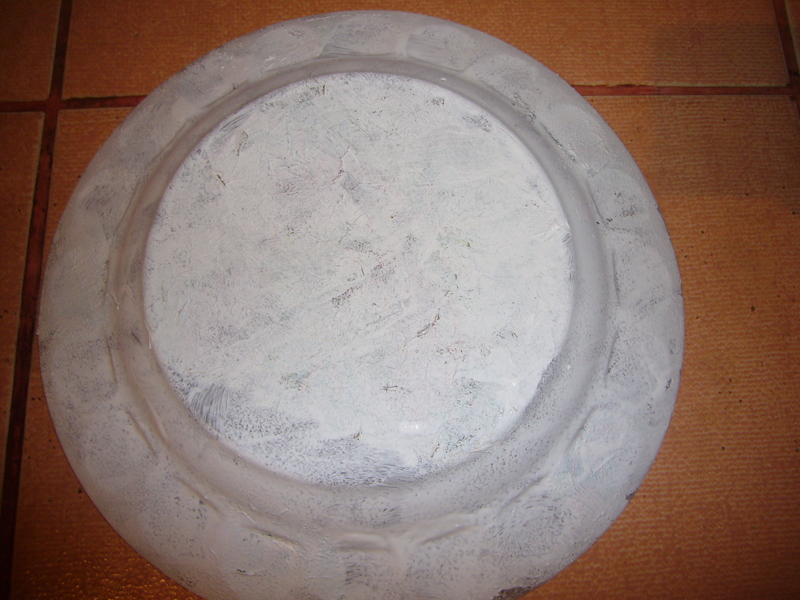 This created a soft texture underneace the paint. 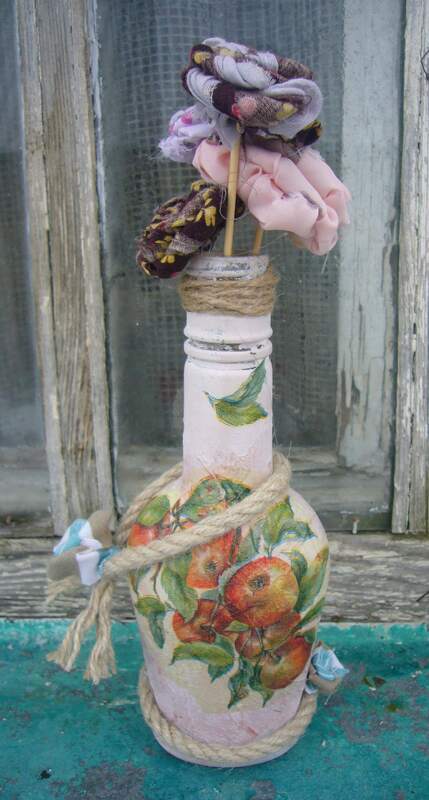 Then I decoupaged the glass bottle vase with apple napkin and covered it with polish. 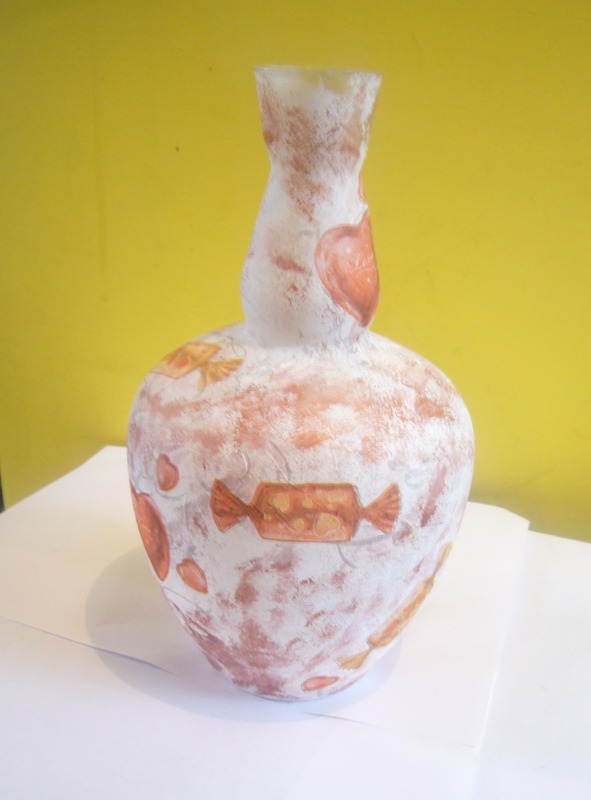 I have also used organic fiber rope to decorate the bottle. 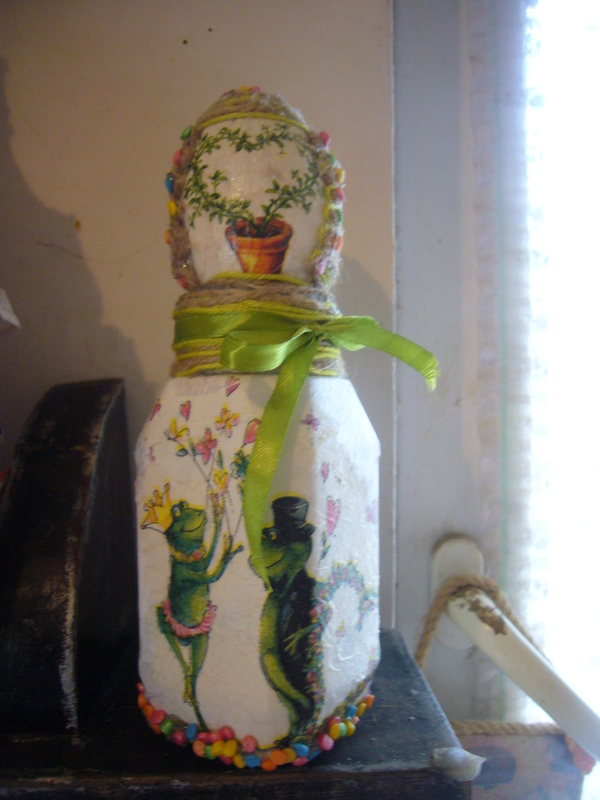 And I made rolled fabric flowers to decorate both the rope on the bottle and to make flowers for this decoupaged glass bottle vase. 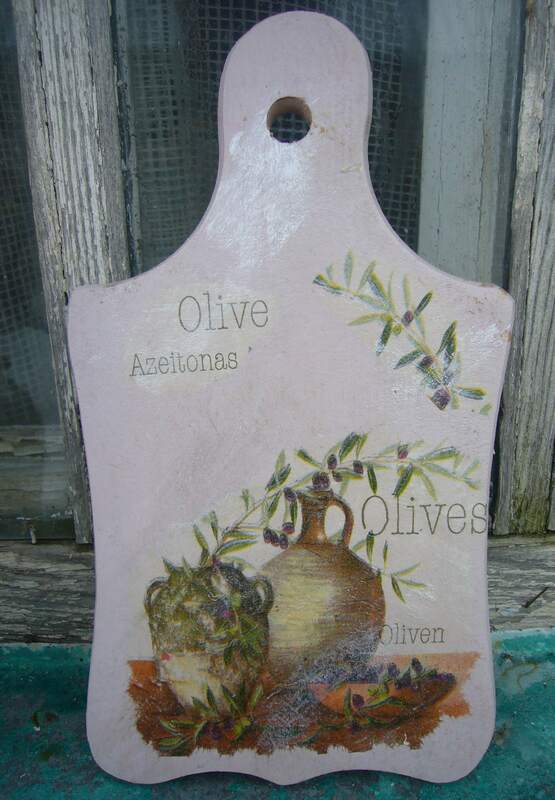 You may order unique and handcrafted items for your kitchen from me. Write me at kievtrnaslator@gmail.com . Find more crafting inspiration on my PINTEREST boards.